India Pale Ale (IPA:) A special type of pale ale originated in England. It is brewed with extra hops therefor it is more bitter than most styles of beers. Hops are a bittering agent as well as a preservative that the English used when exporting their beers to India beginning in the late 18th century. American craft breweries typically make their IPA's with higher alcohol content (7.0+) and IBU's (International Bitterness Unit) above 40 where Bud Light has an IBU of just 6.2. The unfiltered brew might scare away those not used to seeing yeast in their brew, but a 7.2% ABV might calm their nerves. 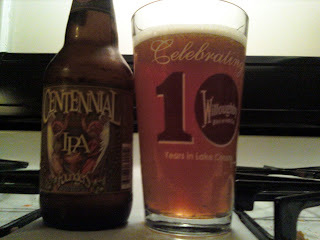 Its flavor is above most IPAs in balance, where the finish does not cover up the aftertaste. This is a beer for everyday, any occasion and a six pack would not be that difficult to incinerate through. What the hell does "incinerate through" mean?